3400 AEGEE members applied for a Summer University this year – and some of the applications were simply outstanding. Lots of people made great videos, drew pictures or simply wrote very creative letters. Here are some of them. Elena Sicilia from AEGEE-Oviedo made maybe the best SU application video this year. Actually, the video, with whom Elena applied for the “Transsiberian Dream vol. 7 – Far East Movement” by AEGEE-Moskva and AEGEE-Sankt Peterburg, is not one video, but 100! Elena, who was AgorAsturias organising team member, filmed herself every day for 100 days, with a sign in her hands about the amazing Russian TSU. “I came up with the idea of the ‘100 days challenge’, as I thought it would be a creative way of showing my determination, and it eventually became a positive daily reminder that helped me to keep going, keep working hard… It actually gave me a reason to have some fun, loosen up and smile every day!”, Elena told the Golden Times. Having success with a great video also works in the other direction: Ekaterina Kalinina, member of AEGEE-Moskva, used this approach when she applied for the Spanish Harry Potter express by AEGEE-Zaragoza, the SU “Kingdom of Dragon vol. IV: Platform 9 ¾“. Actually, she used a two-fold strategy, a great Harry-Potter themed motivation letter with an accompanied video. Would you believe that Anna Kuprickova joined AEGEE only one month ago when you see this video? Anna is from AEGEE-Moskva as well and was accepted to the SU of AEGEE-Barcelona “BarceYOLOna: the catalan adventure”, which was one of the five most popular Summer Universities this year. When the Golden Times asked her how she managed to get so many people from all over the world recommending her on videotape, Anna said: “I worked in several hostels for a couple of month and I told them I wanna go to Spain, help me guys!” A great strategy! There are more artists in Moscow! Seeing that Maria Kochkina was accepted to the SU of AEGEE-Heraklio “The Seduction of Europa” is not a big surprise – after all, Maria is PR Responsible of her antenna and really know how to win an audience. 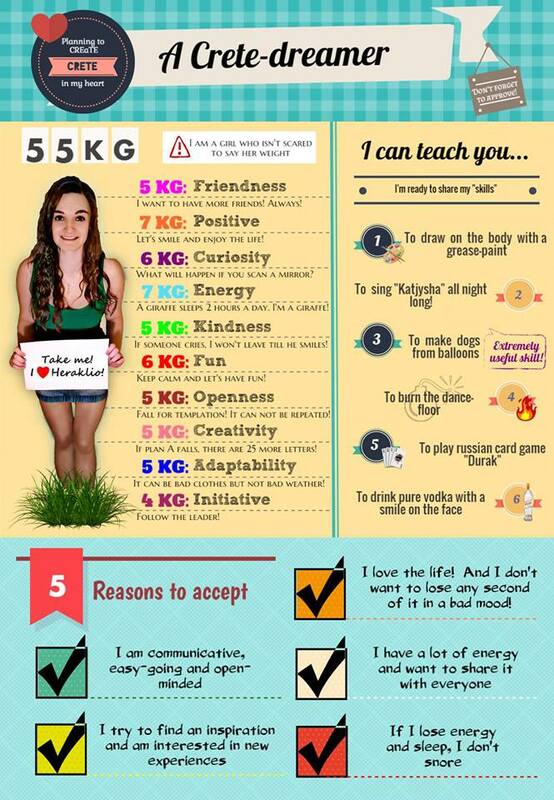 She did not make a video, but made a great complex infographics about herself! And this pretty quick as well. “It took me six hours in total”, she told the Golden Times. Another AEGEE-Moskva board member with artistic skills is Dmitry Shishmarev. 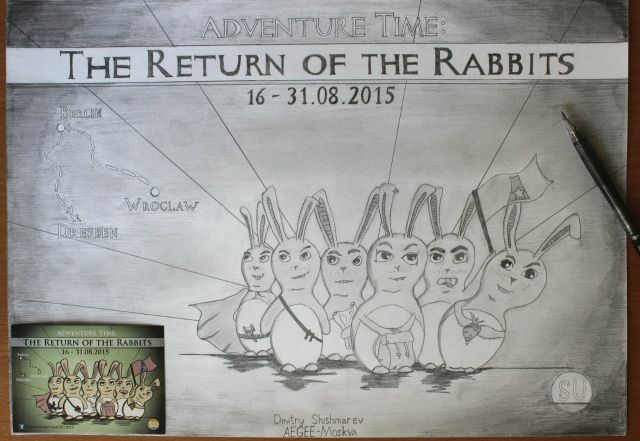 The HR Responsible of the Russian antenna drew the sticker motive of the TSU “Adventure Time: The Return of the Rabbits” by AEGEE-Dresden, AEGEE-Wroclaw and AEGEE-Berlin with his own hand, which got him a place at one of the top eight Summer Universities this year. Spanish AEGEE members are not only the majority of SU applicants, but also make awesome videos, as we have already seen. María Calderón from AEGEE-Zaragoza created the perfect explanation video, including photos and drawings and a smart story, why the AEGEE-Catania SU: “AEGEE of Mythology!” is the right place for her. It took her four days to make this video, she told the Golden Times. Needless to say that she got a place for the second most popular Summer Universities this year! With these amazing storytelling skills she would be perfect for creating all kind of PR videos for AEGEE – for example: “What AEGEE is about” or “How the Agora works”. Someone should ask her before she gets hired by professional companies! There is an unwritten rule that you don’t take couples or siblings together, if they apply for a Summer University. But sometimes you don’t have a choice… because the application that they make together is just awesome. This was the case with the application of AEGEE-A Coruna member Andrés Merayo and his cousin Verónica Arias. The video that they produced together for the TSU “Take the lead in our AdvenTSUreland!” of AEGEE-Budapest and AEGEE-Kraków is fantastic! Of course they were both selected! The very clever video that got Javier Gimeno from AEGEE-Zaragoza into the TSU “Across the UAniverse” by the AEGEE antennae in Kharkiv, Dnipropetrovsk, Kyïv, Ivano-Frankivsk and Lviv starts a bit nerdy with a cool Star Wars reference, but then you just get surprised by the great self-presentation by Javier – and all the great video clips he merged together! Most applicants did not draw or make videos, but wrote texts. Some were really good, some less. Here are smart and funny some examples from the SU of AEGEE-Napoli “Past & Fasul – Through the ages of time!” The participants answered question by the organisers. Enjoy the answers of three different applicants! Question 1: In which historical period and why would you want to live? Answer: “1492, but being in México, as a Mayan, can you imagine that? Is like, hey guys! I just saw 3 f***** boats, there are people with beard saying that they came through the ocean. And you are like: What the heck man? Did you smoke my weed again? -No, I’m talking serious, they said they are from a country called Spain!!! Question 2: If we say that you can bring only three things in your time travel, what would you take? Question 3: With which historical character you would have a night of love? Also the SU “SUrf, SUn and have fun! A different way to SEA the world” by AEGEE-Las Palmas got some interesting motivation letters. Here are a few examples. Remark by the antenna: tacos = Mexican, baguettes = French, purscuito = prosciutto?? = Italian… Good try! Applicant 5 answered to the question: “What is the craziest thing you would do in order to be selected as participant of our SU? You will have to do it if you are eventually one of the luckiest”. It looks like it is gooing to be a hot summer!